Paul Chaney is President of the International Blogging and New Media Association, a nonprofit trade association dedicated to the advance of new media as an industry. He also works as Marketing Director for Bizzuka, a Web content management software company. He has worked as a professional blogger and frequently leads seminars and workshops on business blogging and social media. 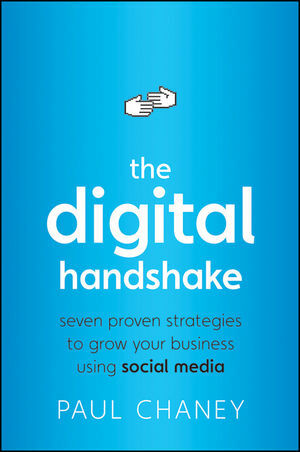 For more information, please visit www.thedigitalhandshake.com orwww.thesocialmediahandyman.com. Foreword Ann Handley, Chief Content Officer, MarketingProfs. Introduction A New Communications Paradigm. PART I: Five Consumer Trends Turning the World Upside Down. Chapter One: Consumer Skepticism Is at an All-Time High. Chapter Two: The Media Is Fragmented and So Is the Audience. Chapter Three: Who Is In Control of the Marketing Message? Chapter Four: Businesses, Improve Your Aim. Chapter Five: Customers Are Mad as Hell, and They're Not Going to Take It Anymore. Chapter Six: What's a Marketer to Do? (Start a Conversation). PART II: Seven Proven Strategies to Grow Your Business. Chapter Seven: Business Blogging: Your Social Media Marketing Headquarters. Chapter Eight: Social Networks Strengthen Your Social Graph. Chapter Nine: Niche Online Communities Can Benefit Your Business. Chapter Ten: Microblogging: Social Media Marketing in 140 Characters or Less. Chapter Eleven: Lights! Camera! Action! Use Online Video to Market Your Business. Chapter Twelve: Podcasting (Overlooked, Underutilized Marketing Tool). Chapter Thirteen: PR 2.0 (Introducing the Social Media News Release). Chapter Fourteen: Other Social Media Marketing Tools. PART III: Putting the Tools to Good Use. (A Social Media Marketing Plan of Action). Chapter Fifteen: A Brief Word About Web Sites, E-mail Marketing, and Search Engines. Chapter Sixteen: Listening Is the New Marketing. Chapter Seventeen: Now That You’ve Listened, It’s Time to Engage. Chapter Eighteen: Measuring the Effectiveness of Your Social Media Marketing Plan.